The article “Reducing Uncertainty and Confronting Ignorance about the Possible Impacts of Weathering Plastic in the Marine Environment” has been selected as one of the Best Papers of 2017 at Environmental Science & Technology Letters. The paper is co-authored by Matthew MacLeod, Berit Gewert, Elena Gorokhova and Martin Ogonowski, all researchers at the Department of Environmental Science and Analytical Chemistry (ACES), together with their collaborators in the Joint Programming Initiative for Healthy and Productive Seas and Oceans (JPI-Oceans) WEATHER-MIC project. 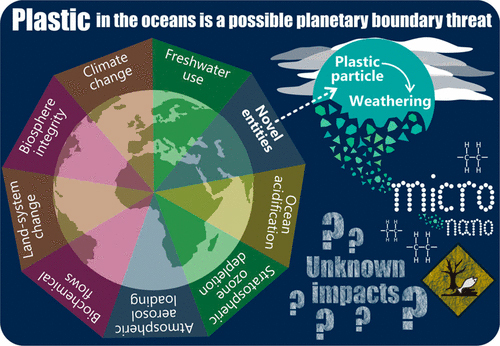 The article describes how plastic in the oceans is a possible planetary boundary threat. “Plastic in the oceans does not pose a significant risk to the marine ecosystem or human health,” says the paper’s corresponding author, Matthew MacLeod, Professor at ACES. “But, we argue that it fits the profile of a planetary boundary threat since it is causing planetary scale exposure that is poorly reversible. If plastic in the oceans is having an effect that we don’t recognize or understand right now, we won’t be able to reverse the damage. So plastic waste should be minimized, and research aimed at understanding potential impacts of plastic in the oceans should be intensified,” says Matthew MacLeod. The winners of the best paper awards were announced on the 20th of March at the Great Achievements in Environmental Science & Technology symposium in the environmental chemistry technical program at the American Chemical Society National Meeting in New Orleans. Environmental Science & Technology Letters is an international forum for brief communications on experimental or theoretical results of exceptional timeliness in all aspects of environmental science and short reviews on emerging environmental science and technology topics. Read the article “Reducing Uncertainty and Confronting Ignorance about the Possible Impacts of Weathering Plastic in the Marine Environment”.